NEW YORK (November 13, 2013) – Last night, Iraq and Afghanistan Veterans of America (IAVA) held its 7th Annual Heroes Gala in New York City. Taking place one day after Veterans Day and likely the last year in which American troops are fighting in Afghanistan, IAVA’s Heroes Gala honored those who have made a unique and lasting contribution to IAVA’s mission to improve the lives of Iraq and Afghanistan veterans and their families. IAVA helped unite the nation during Veterans Day, participating in more than 150 events across the country, including the annual New York City Veterans Day Parade, an IAVA Leadership Fellow attending the White House Breakfast in Washington, D.C. with President Obama, and the #UniteWithVets social media campaign that has brought together tens of thousands of people worldwide. A video with highlights from the Gala can be viewed at http://vimeo.com/79326497. The Heroes Gala was hosted for the fifth year in a row by Brian Williams, anchor and managing editor of NBC Nightly News. 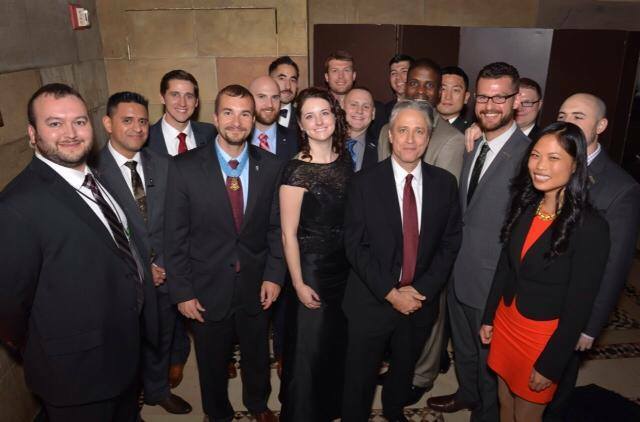 IAVA honored Jon Stewart, host of The Daily Show, with the 2013 IAVA Civilian Service Award. Medal of Honor Recipient Staff Sergeant Salvatore Giunta was honored with the IAVA Veterans Leadership Award. Marc Roberge of the band O.A.R., a historically strong supporter of veterans, performed live. Skip Bayless, Stephen A. Smith, and Cari Champion from ESPN’s First Take were also in attendance, as were ESPN personalities Michael Smith and Jemele Hill. Journalist Bob Woodruff, founder of craigslist and craigconnects Craig Newmark and Super Bowl Champion Coach Bill Cowher also attended the gala. Veterans and supporters were also in attendance, as were representatives from leading sponsors Southwest Airlines (Hero Sponsor), and Joan Ganz Cooney and Turner Broadcasting (Dinner Sponsors). IAVA would also like to thank everyone who contributed to this special night: Hewlett-Packard Inc, JP Morgan Chase, MillerCoors, Viacom, American Express, Bristol Myers Squibb Foundation, Centre Partners Management LLC, Harley Davidson, HBO, Infinite Hero Foundation, MSNBC and NBC, Morgan Stanley, NYSE Euronext, Sands Coproration Western Asset Management Compnay, Oracle, Razorfish, Select Equity, Serving California, Team Daniel, Inc, UBS, Wells Fargo, Hard 8 Management, Brantley Gilbert, eBay Inc, Sunshine Sachs, ibidmobile.net, and LinkedIn.